Step 1. 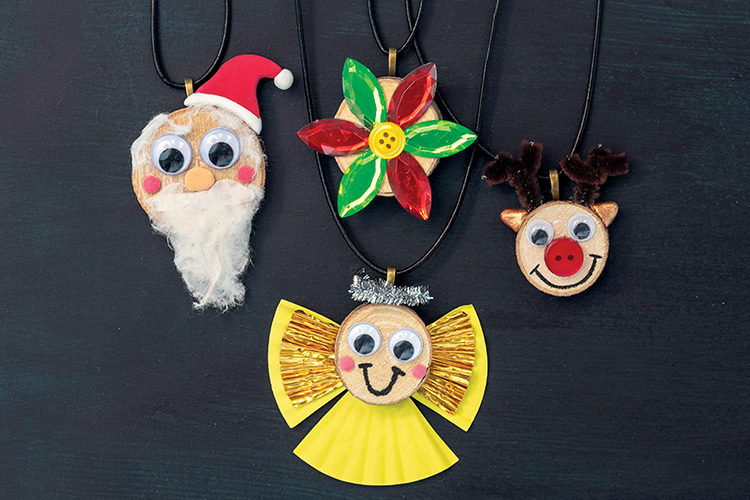 Using the branch cut as a canvas, encourage students to create a festive character or a design using Magiclay and collage materials such as joggle eyes, jewels, buttons, chenille stems and patty pans. Angel: Using an assortment of plain and metallic patty pans, cut out shapes to create the angel’s smock and wings. Use Supertac to glue features to the back of the branch cut. Make a halo from a tinsel stem and glue to the head. Add joggle eyes and draw in a mouth with a permanent marker. Step 2. Use Supertac to adhere a jewellery bail to the back of the branch cut. Allow to dry. Step 3. Thread the desired length of leather cord through the bail, so that it fits around your neck and knot the ends together. Your handmade pendant is now ready to wear!